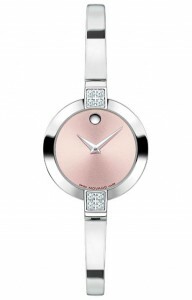 With Movado‘s founding in 1881, over a hundred years in the business creates some quality, innovative products. A simple scroll through the company’s gallery will display a slew of astounding luxury watches. The Bela 0606243 watch is a simple, but by no means unimpressive design; in fact, it’s rather striking. 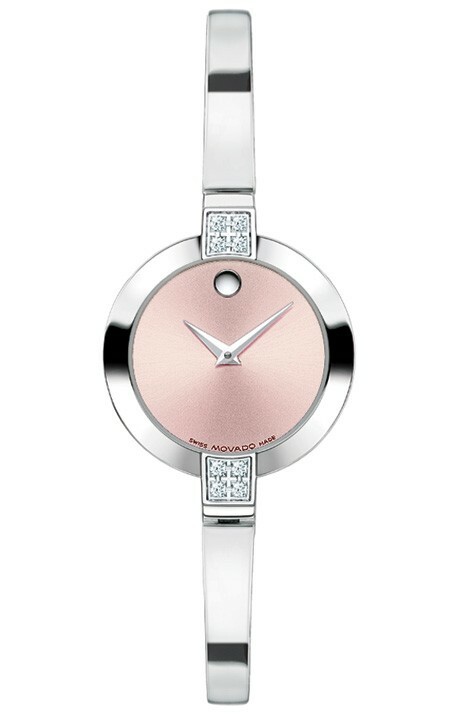 The Movado Museum design is one I’ve never seen before, and it’s the first thing you’ll notice looking at this watch. That’s the design of the dial; it’s completely blank ( in this case it’s pink ) except for a single circle in the upper center. This is an extremely intriguing artistic statement, and the watch at this point seems almost more fashion than function if worn. Of course the hands – only hour and minute – still work perfectly, and will tell time, at least approximately, at a glance. While I’m busy trying to decide whether I like the museum dial ( I’m pretty sure I do), I’ll shift focus to the diamonds. Diamonds are usually a good place to focus, anyway, and they are placed quite appealingly on the Bela. On opposite edges of the case, they frame the dial appealingly and add some glitter to the otherwise smooth shine of steel surrounding the watch. The casing, otherwise, is minimalistic; in fact, there’s really not much to say about it. It’s round, smooth, elegant, and serviceable. That lack of markings, along with its simple design, makes the Bela more of a fashion accessory than a watch, and in this role it excels. Of course like all fashion accessories, the value of the selection depends on the person selecting it, but the diamond-decorated Bela is certainly a striking choice. With a price at just under a thousand dollars, it’s actually on the lesser side of luxury watches, and the unique design may be worth it to the right people. The Bela is also available in black, and with rectangular dials, so some choices can be found with a visit to the Movado website. If your eye is caught by the Bela, taking a look at these choices couldn’t hurt.